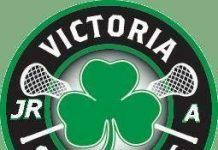 June 12, 2013, Victoria, BC (ISN) – In the second instalment of the Vancouver Island series the Jr. Shamrocks jumped out to a 9-2 first period lead and never really looked back, handing the visiting Nanaimo Timbermen a 19-11 defeat Tuesday at Bear Mountain Arena. Charles Claxton got the start in goal for the Rocks while workhorse Pete Dubenski started for Nanaimo. It looked for the first few minutes like it would be a defensive contest but when the goals started, they came quickly and often for the boys in green. At 4:28 Victoria’s Max Fredrickson took a pass on the corner of the crease to put the home team up by 1. That was the first of 6 Rocks goals in less than 3 minutes. Brody Eastwood connected at 5:17 followed by Dane Sorensen capitalizing in close at 5:37. Conrad Chapman made it 4-0 at 5:44 on a breakaway off the faceoff and Eastwood increased the gap to 5 goals cutting to the net at 6:24. Capping off the 6-goal run was Fredrickson with his second at 7:26. Brett Fleming finally got the Timbermen on the board at 8:18 when a long hard shot got behind Claxton. Victoria came back with 3 straight goals on the power play, Dane Schoor from the corner of the crease at 11:57, Chris Wardle finishing off some great passing at 13:15 and Schoor getting his second at 18:05. Nick Sanderson managed to get one more back for Nanaimo with just 5 ticks left on the clock when he caught the Shamrocks napping on what they thought was a 30-second clock infraction. That made the score 9-2 after the first with the Rocks holding a big edge in shots on goal, 20-11. The second period was much tamer in terms of scoring as Victoria scored the first 3 goals of the period, followed by Nanaimo coming back with 3 in the second half of the period. Chris Kasper capitalized on a long shot through traffic just 45 seconds in. Schoor then got his hat trick goal at 3:18 gathering in a long outlet pass off a loose ball battle. At 6:56 Kasper collected his second getting in alone and faking Dubenski out. Devon Casey made it 13-2 at 9:35 on a long shot and that prompted the visitors to make a goaltending change, substituting Nate Clarke for Dubenski. Clarke played well and his teammates gave him some support, scoring the next 3 goals. Terrin Davies scored on a nifty little backhander in close at 10:43 then Corey Shires notched one on the power play at 13:50, firing a bullet from just ouside the dotted line. Shires picked up his second of the contest at 18:01 on a hard low shot with a delayed penalty about to be called on the Rocks. The visitors held the edge in shots on goal in the middle frame by a 23-12 margin but were only marginally closer on the scoreboard as Victoria took a 13-5 lead to the dressing room. A flurry of scoring got the third period under way, 7 goals in the first 5:13 but 5 by the home team. It was Nanaimo getting things started just 29 seconds in, Fleming getting his second on the power play, faking high and shooting low with a 5-on-3 man advantage. Schoor picked up his 4th of the game for the Rocks, a shorthanded marker at 1:02. Wardle got his second on the power play at 2:20 for Victoria, squeezing the ball inside the post but Sanderson collected his second for the T’Men, shorthanded at 3:07, a shot that trickled through. The home team rattled off 3 more in the next minute and 12 seconds, a power play from Jesse King at 4:01, Jake Cullen on a bullet from outside the dotted line at 5:00 and Jamie Sorensen adding to the total at 5:13. Nanaimo came back with 3 of their own off the sticks of Mitch Parker, Sanderson with his third of the contest shorthanded and Davies his second at 126. The teams traded goals before the game ended, Eastwood getting his third for Victoria and Parker his second for Nanaimo at 19:31. Shots on goal at the end of the game were 51-49 for the Rocks so Nanaimo came back strong in the second half of the game. Jesse King led the Shamrocks with a goal and 5 assists. Three of his teammates had 5-point nights: Dane Schoor with 4 goals and 1 assist, Brody Eastwood with the hat trick and 2 helpers, Chris Wardle 2 goals and 3 assists, Devon Casey had a goal and 4 helpers. Max Fredrickson and Chris Kasper each had 2 goals and 2 assists. Other Victoria scorers were Dane Sorensen, Jamie Sorensen, Conrad Chapman and Jake Cullen. Intermediate call-up Matt Hamilton had a solid outing, contributing 4 assists and Charles Claxton was strong between the pipes, kicking out 38 of the 49 shots he faced to pick up his first win. 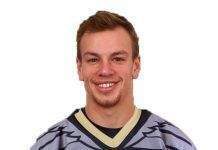 For the Timbermen it was Mitch Parker leading the way with 2 goals and 4 assists. 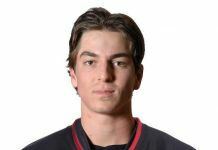 Local product Nick Sanderson had the hat trick and 1 assist with Cory Shires picking up 2 goals and 3 assists. Brett Fleming and Terrin Davies each had a pair of goals and Macgregor Johnston had 4 helpers. It was a tough night for starting goaltender Pete Dubenski but Nate Clarke was pretty strong in relief. The result leaves the Shamrocks in a 3-way tie for second place in the league standings, 2 points behind the league-leading Delta Islanders and 2 ahead of the Langley Thunder. Next home game for the Rocks is Saturday at 5:00 pm when they will host the Port Coquitlam Saints at Bear Mountain Arena. It will be the first meeting between the two teams, the 6th place Saints having a pretty good season, only 6 points out of first place. 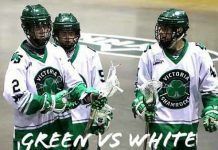 Victoria Junior Shamrocks Head to Head Green vs White Scrimmage Well Attended.